It’s no secret by now what the shale gas (and oil!) renaissance made possible by the deployment of advanced hydraulic fracturing technology has done for the nation’s economy, its geopolitical position, and the millions of consumers and manufacturers who continue to benefit from historically low energy costs. But the case in support of shale’s salubrious effect on air quality and health continues to be an underreported phenomenon – mostly because, unlike those other great benefits delivered by shale, the health and wellness impacts have largely been a function of indirect factors further down the consumption chain. 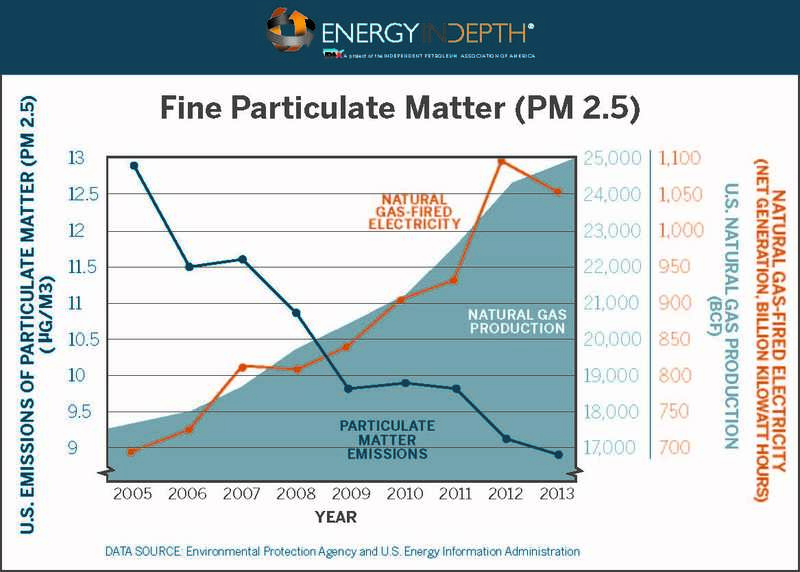 Data from the U.S. Environmental Protection Agency (EPA) and the U.S. Energy Information Administration (EIA) show a 60 percent decrease in PM 2.5 from 2005 to 2013. Over that same period, U.S. natural gas production increased by 35 percent, and natural gas-fired electricity generation increased by 50 percent. PM consists of particles that can be generated from industrial activities, or produced from natural phenomena such as forest fires. According to the EPA’s 2009 “Integrated Science Assessment for Particulate Matter,” fine particulate matter can cause early death, cardiovascular or respiratory harm. 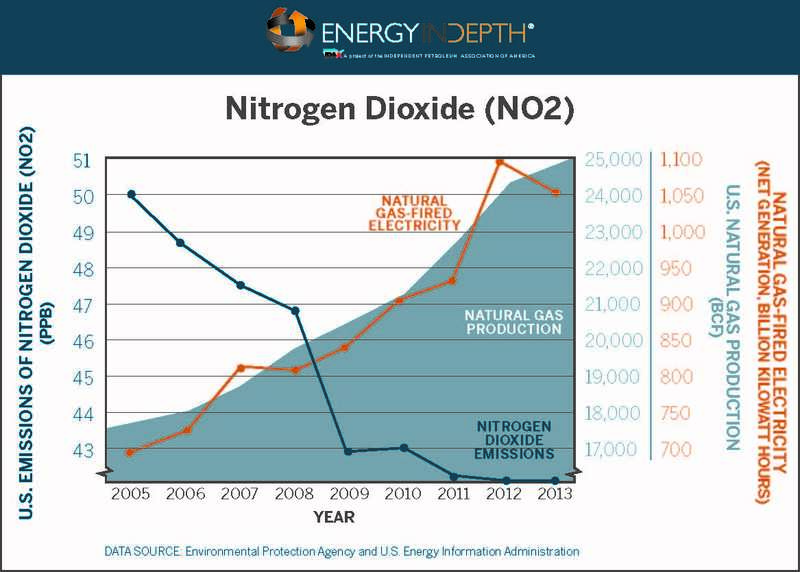 Another prominent pollutant on EPA’s radar screen is nitrogen dioxide (NO2), which most often comes from vehicle exhaust and, when paired with sunlight and other things, can contribute to ground-level ozone formation. 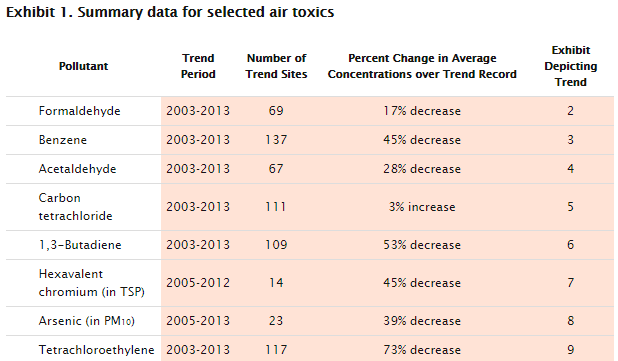 According to EPA, there is “a connection between breathing elevated short-term NO2 concentrations, and increased visits to emergency departments and hospital admissions for respiratory issues.” As the following chart shows, NO2 emissions declined by 52 percent as natural gas use skyrocketed. Importantly, as EPA explains, acid rain is “caused by a chemical reaction that begins when compounds like sulfur dioxide and nitrogen oxides are released into the air.” So with 68 and 50 percent reductions in SO2 and NO2, the incidence of acid rain across the United States has also been dramatically reduced. 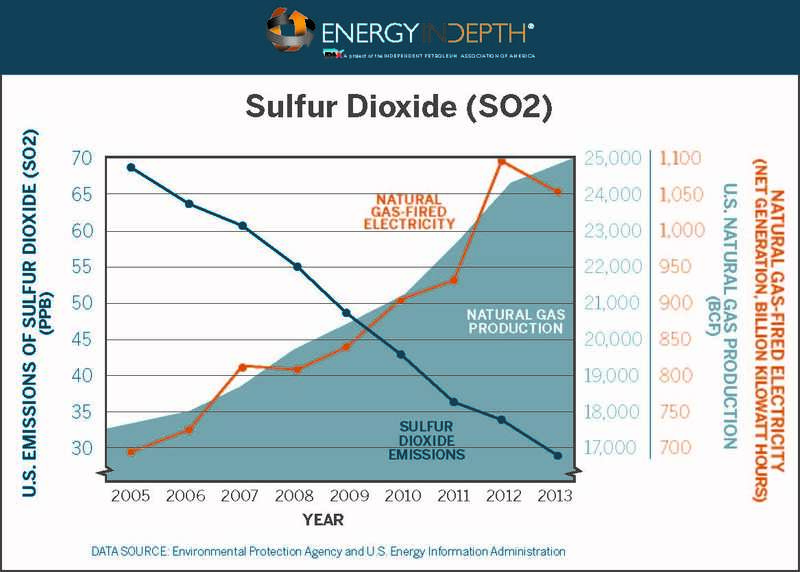 Public awareness of the significant role that natural gas has played (and continues to play) in improving our nation’s air quality has grown over the years, and today even those who oppose fossil-fuel use and development have been forced to grudgingly concede and acknowledge those facts. But fewer observers have been willing to assign proper credit to the technologies that have made the discovery of these natural gas supplies possible. A study by the Texas Department of State Health Services which used incorporated testing of individuals’ blood samples to see if there was a relationship between air emissions and poor health. The researchers concluded there was no connection. From 2005 to 2013 emissions of PM 2.5 have decreased by 60 percent; emissions of SO2 decreased by 68 percent; and emissions of NO2 decreased by 52 percent. As regulators and scientific experts have noted, this progress is largely due to the skyrocketing production and use of natural gas. To be clear, energy development, whether we’re talking about fossil fuels or renewables, is not a risk-free endeavor. But the data not only show miniscule emissions from shale development, but also enormous reductions in pollution across the board attributable to the massive increase in natural gas consumption that hydraulic fracturing has made possible. These benefits have accrued in addition to an increase in jobs, tax revenue, and other economic gains – making natural gas a win-win in terms of benefitting public health and the economy alike.